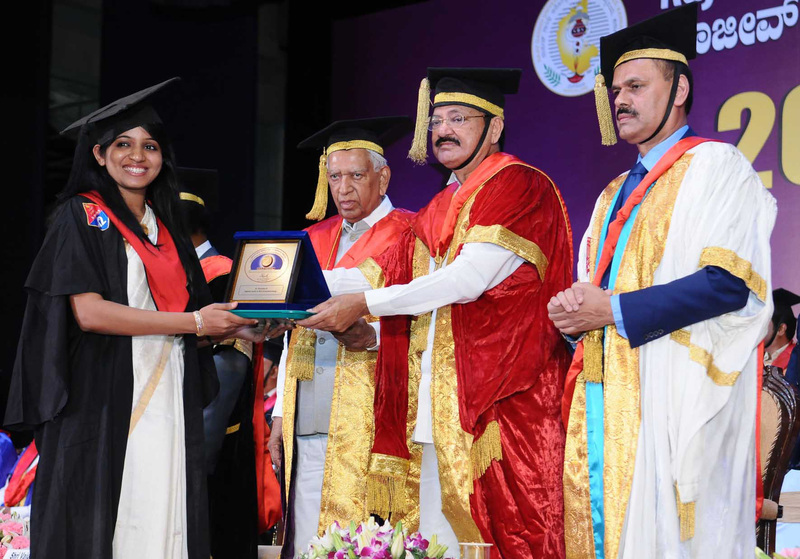 The Vice President, Shri M. Venkaiah Naidu presenting the Degrees to the Students, at the 20th Convocation of Rajiv Gandhi University of Health Sciences, in Bengaluru on April 12, 2018. The Governor of Karnataka, Shri Vajubhai Rudabhai Vala is also seen. 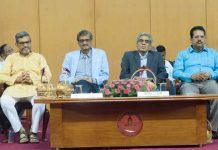 New Delhi: The Vice President of India, Shri M. Venkaiah Naidu has serving in rural areas must be made mandatory for Doctors and they should have empathy, compassion and a caring attitude to enhance their effectiveness. He was addressing the 20th Convocation of the Rajiv Gandhi University of Health Sciences, in Bengaluru today. The Governor of Karnataka, Shri Vajubhai Rudabhai Vala and other dignitaries were present on the occasion. The Vice President asked students to become full-fledged healthcare professionals who can take on the real and continuous challenges that are going to become an integral part of your life. He said that despite making rapid strides in the last two decades, continuing rise in communicable diseases and a spurt in non-communicable or “lifestyle” diseases pose greater challenge to the nation. The evolution of the sector calls for active involvement and participation of all stakeholders and the use of innovation to bridge intent and execution to overcome change at all its stages – prevention, diagnosis and treatment, he added. The Vice President said that the urban-rural divide in India needs urgent attention and action and said that collaborative public-private partnership to remedy the situation. However, the private sector health facilities must not only be accessible to the needy and poor, but must also be affordable, he added. 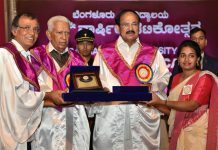 The Vice President said that India can leverage the demographic dividend by improving the quality higher education adding that education system needs to reinvent itself to respond to the emerging challenges of a rapidly changing knowledge economy. Excellence should be the watchword. Agility and alacrity should be the norm, he added. “It is indeed a great pleasure for me to deliver the convocation address on the occasion of the 20th Convocation of Rajiv Gandhi University of Health Sciences, Karnataka. Convocation marks a culmination, a milestone, a moment of celebration. It is a day to which all students look forward to because they acquire a degree after years of hard work and study. It is a day that is precious to the faculty as it marks yet another important milestone in their mission. It is a celebration that the parent eagerly await as their rejoice at the progress made by their children. I would like to congratulate all those who are graduating. My special appreciation to those who have received awards, medals and distinctions. I also offer my greetings to the parents and appreciation to the faculty, staff and leadership of this great institution. Dear Students, this is a transition time when you are at the threshold of becoming full-fledged healthcare professionals ready to take on the real and continuous challenges that are going to become an integral part of your life. We are now at a defining moment of our country’s history. It is a moment of formidable challenges. It is also a moment of widening opportunities. By 2030, India is likely to be the youngest nation in the world with nearly 140 million people ready to enter the institutions of higher education. One in every four graduates in the world will most likely be a product of the Indian higher education system. If we in India can improve the quality of higher education, we can leverage the demographic dividend for the benefit of the society and community. Excellence should be the watchword. Agility and alacrity should be the norm. I am happy to note that Rajiv Gandhi University of Health Sciences, with the largest network of affiliated institutions in the world has pioneered many innovations in the field of healthcare education. 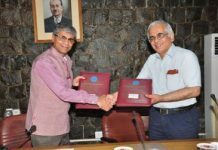 It has emerged as a globally credible brand due to the unstinting efforts made by the leaders of this University since its inception. India has made rapid strides in the last two decades. The proportion of people living in poverty fell by half. However, this period of rising prosperity has been marked by a “dual-disease burden”, a continuing rise in communicable diseases and a spurt in non-communicable or “lifestyle” diseases. We have to address both these health concerns. 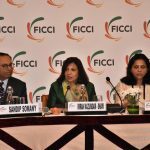 Healthcare delivery in India is now uniquely poised to undergo a change at all its stages – prevention, diagnosis and treatment. No single entity in the healthcare sector can deliver results and achieve health outcomes. The evolution of the sector calls for active involvement and participation of all stakeholders and the use of innovation to bridge intent and execution. Dear students, as you all are aware, there is an acute shortage of doctors as also healthcare facilities in the rural areas. India has less than one doctor for every 1000 population. The rural areas are much less covered as compared to urban areas. There is an urban-rural divide that needs urgent attention and action. We cannot have two Indias, with the cities having the state-of-the-art facilities and the rural areas lagging behind. There has to be a collaborative public-private partnership to remedy the situation. However, the private sector health facilities must not only be accessible to the needy and poor, but must also be affordable. You have acquired new knowledge, new skills and new attitudes during your stay in this reputed institute. You are graduating as a certified medical professional, as a doctor with a commitment to care for the sick and the infirm, to cure the illnesses and restore human beings to good health. There cannot be a more noble profession than what you have chosen because you are the one who can heal, who can cure, who can add ‘life’ to ‘years’. You can bring good cheer to a depressed person, you can provide hope to those who are losing hope. In short, you have the capability to change the lives of people. Which is why people look upon doctors as demi-gods or as the ancient Indian saying goes ‘Vaidya’ is truly a ‘Narayana or Hari’. Your entry into the noble profession today opens up for you unforeseen and unprecedented opportunities for serving humanity. It depends on you as to how you use these opportunities. As I said earlier, India offers you immense opportunities with ever expanding state of the art healthcare infrastructure and responsive health insurance system. You can grow as sound professionals by practicing what you have learnt. You can keep learning and refining. You can improvise and innovate. You can chart out new path breaking trajectories. Serving in Rural areas must be made mandatory for Doctors. Doctors must educate people on the adverse affects of Lifestyle diseases. 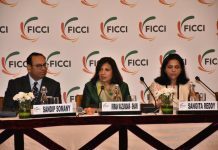 The demand for healthcare services in our country will undoubtedly be growing and the range of healthcare issues you will be addressing in India will be among the broadest in the entire world. When you treat a large volume of patients, your experience will broaden your professional skills. If you can keep updating your knowledge and skills by learning from the latest advances across the globe, you can certainly emerge as the leaders in your profession. Empathy, compassion and a caring attitude enhance your effectiveness. Ethical behaviour enhances your credibility and stature. Medical science like all other fields of knowledge is evolving rapidly and recent technological advances including imaging and robotics have brought in an unprecedented revolution in diagnostics and treatment. Improved drugs have made treatment of hitherto untreatable diseases possible. You all need to keep abreast of these developments and lead the world towards future developments in the medical field. Along with this, I would urge you to focus on preventive medicine as well and more work with communities to bring about lifestyle changes. Our country has a long history of ayurveda, yoga and a holistic approach to health and well being. You would do well to draw inspiration from some of these traditions and integrate them with your medical practice. As our ancient seers have said: “Sarve Santu Niraamaya” (Let everyone be free from illness) should be our ultimate objective. I once again wish you all the very best in the future. I hope that the Vice Chancellor and the faculty members will set their sights higher with each passing year and keep achieving new milestones on their institutional journey towards excellence.